The Mackie 1604 VLZ4 16-Channel 4-Bus Compact Mixer includes a combination of Onyx preamps and a high-headroom / low-noise design. All 16 channels feature an Onyx microphone preamplifier, line input and insert in a compact 4-bus design built for application flexibility and professional performance. The mixer is solidly built with a rugged steel chassis and high-contrast controls for tactile control. 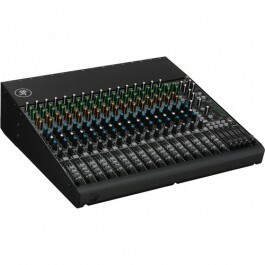 It is a band-friendly analog mixer used in professional broadcast and post facilities.